If your church has a Vacation Bible School program, make sure you let everyone know the date, time location, and what the theme is with custom yard signs. You can display the yard signs in front of your church, and around town before your event to raise awareness and get more participants. Our yard signs are printed in full color, so you can be as creative with your design as you want! 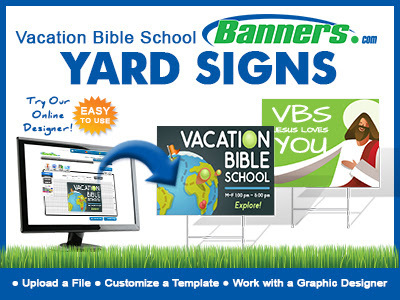 Banners.com makes it easy to order custom yard signs for your Vacation Bible School program. You can customize one of our templates in the online designer by adding a background image, clip art images, text, and other images. You can also upload your own print ready artwork file, or work with one of our graphic designers. Visit our Banners.com to get started on your order.